PPT2DVD Pro enables you to convert your PowerPoint presentations to DVD movies retaining all features in the original PowerPoint, such as animations, transitions, sounds, and video clips. Easy to create your DVD presentation! PPT2DVD Pro converts PowerPoint presentation to 130 popular video formats such as AVI, WMV, MOV, MPEG, etc. for sharing on websites, blog, or portable devices such as iPod, iPhone, Apple TV, and Pocket PC. Convert PowerPoint files to DVD in simply 3 steps. Burn up to 12 PowerPoint presentations to DVD at one time with this PowerPoint to DVD converter. PPT2DVD Pro enables you to create professional look DVD menus with 46 carefully designed built-in DVD menu templates for quick playback and navigation, including themes such as business, celebration, education, nature, and church. Before converting PowerPoint to DVD, you can choose to play it like a movie in the auto mode, or navigate it by remote control in the manual mode. You can add your own logo to the output to personalize the Presentation after being converted to DVD. Wondershare PPT2DVD Pro built-in DVD burner helps you burn PowerPoint presentations to DVD automatically. Also, it enables you to burn the separate output (ISO) to DVD to make copies. A computer with PowerPoint program is not necessary for presentation playback and a DVD player will handle it. DVD can be made as the backup for your presentation for long preservation . DVD is the ubiquitous medium supported by most computers and players. The presentation in DVD format will protect your PowerPoint file from being modified. 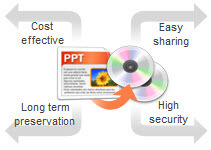 PPT2DVD Pro helps users crack the obstacles of transporting, playing, and sharing PowerPoint files in wide areas. Video Tour - See how PPT2DVD Pro converts PowerPoint presentations to DVD in a few clicks. Burn one PowerPoint presentation to DVD without DVD menus.